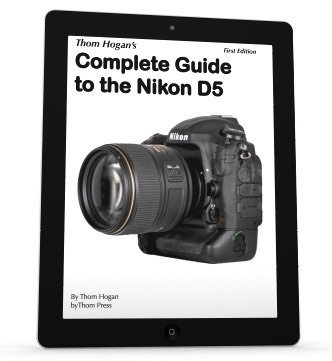 Thom Hogan's Complete Guide to the Nikon D5 helps you understand and master the use of the Nikon D5 DSLR. With over 1000 (!) pages of detailed, complete, and useful information, you'll find all your questions about the camera and how to use it answered. This book (supplied as an eBook PDF file) contains everything you'd want to know about the Nikon D5 and how to use it. You'll find deep explanations with more examples and suggestions than in previous and other guides, all in the no-nonsense and understandable writing style for which Thom Hogan has become famous. No matter how well you think you know the D5, you'll find things in this book that you didn't know about it. That includes information about the firmware updates for this camera (and documentation of the new features), use of the WR-R10/WR-T10 remote, information on what Small and Medium NEF files really are, and much, much more. That’s why it's called a "complete guide." What else is covered? The new sensor, the new autofocus system (including some new recommendations), metering, video including HDMI recording of video and 4K video, XQD and SD card selection and use, lenses, the new Automatic AF Fine Tune facility, image quality, use of the WT-6/6a with the camera...basically everything there is to know about the D5. Did you know that you can set IPTC data in the camera directly, or from files you create on your computer? Do you know how to distinguish between a D5 settings file and a D500 or D850 settings file? This book will cover those things and a lot more. The Complete Guide to the Nikon D5 is a must-own for any D5 user. There simply isn't any other work out there that comes close to touching the detail, usefulness, or completeness of this work. The work can only be purchased from this site. Organized to help you learn. With distinct sections for what you need to know before using the camera (background and setup), while using the camera (shooting features), and after using the camera (what to do with your images). Video is covered in a separate section, too. A complete instruction manual and an introduction to relevant digital issues in one book. Thom Hogan's Complete Guide to the Nikon D5 manages to not only fully describe every feature of the D5 in clear, easy-to-understand language, but gives you rich, technical background for many of the critical issues that confront digital camera users. Nikon flash and autofocus modes explained in plain English! Wonder how the new radio i-TTL flash works? Can't figure out the new autofocus system and how Dynamic autofocus, Release Priority, Focus Priority, 3D Tracking autofocus mode and changed, plus a host of other things that Nikon changed in the new focusing system? Thom Hogan's Complete Guide to the Nikon D5 explains these terms and accompanying techniques in the same simple, no-nonsense language that made his Nikon Field Guide a best seller. Includes instructions for the SB-500, SB-700, SB-900/SB-910, and SB-5000 including for wireless use (both optically and wirelessly). Wireless coverage: The eBook covers the WT-6/6a wireless adapter. eReader and iPad users: the PDF files have been tested only on the B&N Nook Color, the Kindle 3 and Kindle Fire, and the iPad (Mini, Air, and Pro) using the Adobe Acrobat Reader application. Other devices are not directly supported by byThom (though they usually are able to use the files). Kindle users should read my PDF FAQ pages, as Amazon's direct PDF support is limited mostly to reading (there are other options for Kindle Fire users). See this page for more information about what you can read my books on. This product is only available from this Web site and only via download and revisions are only sent to valid purchasers.